Bartons’ marine department has developed a reputation as a niche practice meeting the diverse needs of the industry. Our clients range from UK and international marine insurers, P & I clubs, ship owners and operators to yacht clubs, local ports and harbours, marine related businesses and the fishing industry. For contentious issues, we are fully committed to helping you resolve your dispute/claim using Alternative Dispute Resolution and mediation as preferred methods. We can advise on defence claims, marine insurance disputes, surveyors’ negligence and salvage claims. We are experienced in dealing in international law. For non-contentious issues we can provide a complete package of marine services, including advice on ship and yacht sale, purchase and registration, marine finance and mortgages, shipbuilding and crew issues. We can provide quick advice in relation to ship arrest and detention, shipping casualties, collisions, personal injury and fatal accidents. We have close links with marine insurers and the shipping industry and play an active role in the British Marine Federation. Our marine advocacy department deals with both the defence of criminal acts, including prosecutions brought by the MCA and MMO, and prosecuting for fisheries offences. Lee, Jo, Tristan and Cory are all cited in Legal 500 2018 and were awarded the Devon and Somerset Law Society Client Services Award for 2017. In 2018 Bartons’ Marine department has been awarded the prestigious Firm of the Year (Regional) in transport by the Legal 500. The award citation states ‘Bartons is praised not only for its excellence in law, but for its impressive knowledge of the practicalities of the area’. 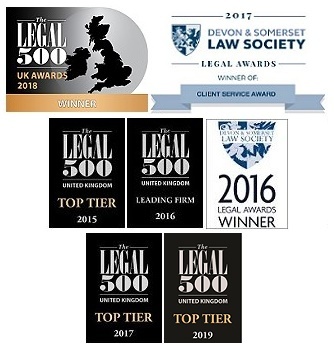 Legal 500 2018 cites Bartons as ‘one of the best in the region’. All solicitors in the team are qualified as RYA accredited Day Skippers. ‘True specialist’ Lee Hassall is managing director. Jo Pummery heads the team and is ‘one of the best known lawyers in the field, enormously experienced and technically savvy’. ‘Very competent’ barrister Tristan Harwood deals with prosecution and defence work. Assistant solicitor Cory Cuff is also recommended. The firm ‘punches above its weight’, has ‘very few comparables’ and is ‘very prompt in responding to complex enquiries’. Chambers 2019 cites Bartons as a Recognised Practitioner: Managing director Lee Hassall ‘is a skilled mediator’ and head of the marine team Jo Pummery ‘offers expertise in a variety of marine matters’, being described as a ‘personable, practical and sensible’ lawyer.